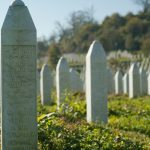 Working with police is becoming an important feature of our work at Remembering Srebrenica, and we welcome the support from the National Police Chiefs’ Council, who have encouraged constabularies across the UK to mark the genocide. In order to support police in commemorating the Srebrenica genocide, we have created a tool that can be used as a presentation or a workshop, linking hate crime and some of the 10 stages of genocide, so that police officers, control room workers, as well as cadets can learn from Bosnia, and understand how forms of hatred can intersect and compound each other in the UK. One of the most impactful ways to engage people with Srebrenica is through survivor testimony. Honour their brave testimonies by sharing their stories through our event videos, which will be available shortly. We can provide free booklets, and we also have flags available for a fee; to register your event or to request a flag, please email events@srebrenica.org.uk so we can support you.